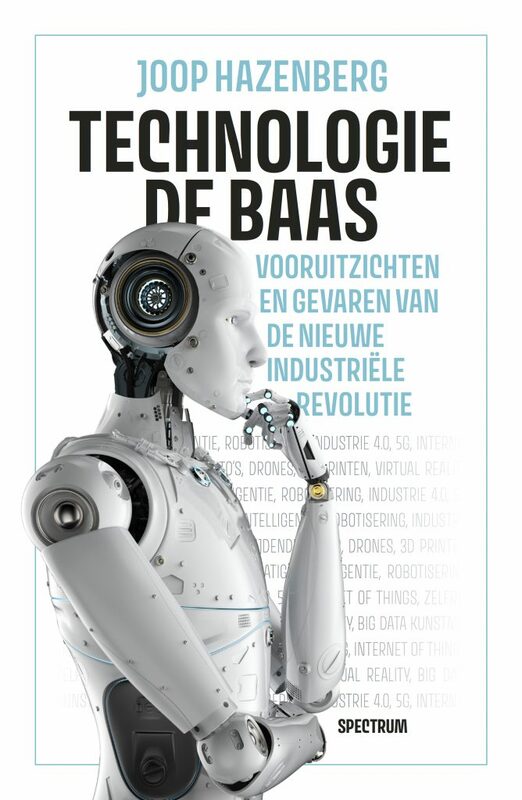 Na een jaar van onderzoek, verkenning en schrijfwerk is mijn vijfde boek verschenen: Technologie de baas, vooruitzichten en gevaren van de nieuwe Industriële Revolutie. Het boek is vanaf 4 april verkrijgbaar bij boekhandels in Nederland en België, alsmede online te bestellen. Worden de toekomstvisies van sciencefictionfilms werkelijkheid of leidt technologie ons naar een betere wereld? Na de uitvinding van de stoommachine, de introductie van elektriciteit en de komst van computer en internet, staan we aan de vooravond van een nieuwe industriële ommekeer. Het tijdperk van de vierde Industriële Revolutie barst los. die hieruit voorvloeien. Blijven we de technologie uiteindelijk de baas? En kunnen we de komende ontregeling van economie en samenleving wel in goede banen leiden? In Technologie de baas helpt Joop Hazenberg ons op weg in de verbazingwekkende wereld van de technologie. Als expert in de digitale economie weet hij alles van de vele mogelijkheden die de massale technologisering met zich mee brengt, maar heeft hij ook zicht op keerzijden als het verlies aan privacy en stijgende ongelijkheid. Zijn analyse is verplichte kost voor beleidsmakers, bedrijven en burgers die de vierde Industriële Revolutie willen begrijpen. It has been six years now. Early 2013 I came to Brussels with a bunch of bags and plans, two phones, a laptop and an iPad to start a nomadic adventure of an existence in two cities at the same time. I rented a room with an acquaintance, set up shop in the Press Club Brussels and started my part-time life here in the capital of the EU. The other half I spent in Amsterdam, my real hometown where my boyfriend, cat and friends lived, where we had a house instead of a room with furniture which wasn’t mine, where cars wouldn’t speed every minute past the single glazed window of my Brussels flat. Today, the adventure has turned into a new life which is all about Brussels, and where Amsterdam only plays a part in the background. The Amsterdam life elements of relationship, cat and house are gone, followed in Brussels by a new relationship, an apartment and a dog (while in 2018 I had to put down my Brussels-based cat and dog, both due to cancer). I even have a car now, as you are almost supposed to have one here in Belgium. Another step to integrate here is the purchase of an old farm in the Ardennes, which we are converting into a retreat and B&B. So I find myself firmly based in Belgium – though not fully rooted yet. This country offers a lot of highs and a swell of lows. 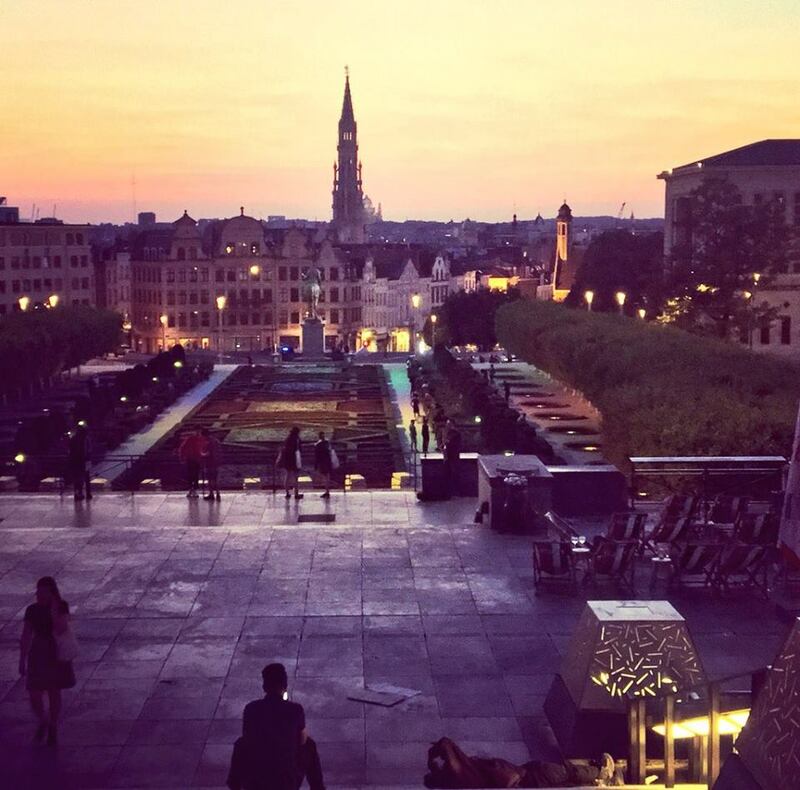 Here is my top-5 of pleasures and annoyances for those seeking a new life in Brussels. 1. Brussels is truly cosmopolitan. Around a third of the ‘Brusselaars’ has been born in a different country and you can definitely feel this on the streets. Though French is the dominant language, you will hear a lot of English, Arabic, Italian, Spanish and countless other tongues when walking around. This gives a fantastic international vibe to the city. It is also a place without a strong national identity so this makes it relatively easy to adapt for newcomers. 2. This city is buzzing. You wouldn’t notice it when you walk through the dead streets of the EU quarter or stumble over the tourists on the Grand Place, but Brussels is full of life. Especially in cultural corners there are so many activities that you can barely keep up, whether it is a particular kind of a music scene you’re interested in, modern art (lots of galeries), gay life with the (in)famous parties of La Demence and Revelation, or just the hundreds of free open air festivals evolving around music, beer and food. Brussels is not a big capital with just 1.2 million inhabitants, but it has a lot to offer for its size. 3. Beer. Not so much a beer lover myself, as I grew up with Grolsch, Heineken and Bavaria, I ditched my beer glasses a decade ago. But since I live in Brussels, I have educated myself in the beer business as Belgium just makes the most wonderful beers, full of tastes and contrasts. You can go to several bars here in town where they will have a few hundred different locally brewed beers on the menu. After tasting and enjoying a long list of these, my personal favourites are for example Zinnebir, Westmalle Triple, Maredsous Blonde, Lupulus and La Chinette. 4. Finding work and making friends. I have always been fascinated by European integration and globalisation. But it was really hard to find work on these topics in the Netherlands. In Brussels, mainly because of the presence of the EU and NATO, there are literally tens of thousands of jobs on international cooperation. Since my move, I have worked as a freelance correspondent, a communications advisor for climate NGOs and since 2016 I work for the GSMA, focusing on technology and the digital economy. It has been a great ride until now. Also in terms of meeting people. Apart from all the talented colleagues you can work with, it is very easy to make new friends. For absolute newcomers: try the market drinks at Place du Chatelain on Wednesday and mingle with the EU trainees on ‘Place Lux’ every Thursday. 5. Vicinity. Though Belgium’s infrastructure is falling apart (more about that below), Brussels is extremely well connected. You can travel by train to London, Paris, Cologne and Amsterdam in around two hours or less (the Thalys takes you to the heart of Paris in 80 minutes). Brussels Airport is compact and has direct connections to almost all important destinations in Europe, as well as to Africa, the US and Asia. So if you get tired of the city, a weekend away is organised with a few clicks. The sign says in French: Cyclists, go on foot. In Dutch it says: Pedestrians, go on foot! 1. The daily traffic hell. Brussels is one of the most congested cities in the world. Every day, hundreds of thousands of people flock into the city, taking their state-sponsored car or the train on their way to work. Biking in this town is outright dangerous as there are virtually no separate bike lanes, and car drivers are not used to cyclists, leading to a lot of aggression and (deadly) accidents. Even walking is not so healthy as the air is very polluted due to the mass amount of diesel cars on the road. Car is king in Belgium and sadly, this applies to Brussels as well. 2. Chaos in the city. Brussels is badly managed. The city is split up in 19 different municipalities, each with their own mayor. There are a thousand elected politicians, governing the myriad of organisations that keep Brussels running. The municipalities have a lot of trouble coordinating their policies, from traffic to trash collection. Besides the governance problems, there seems to be a gross neglect of rule of law. Rules are simply not enforced, or sometimes they are – it is very random. People park on pavements, on pedestrian crossings all the time without being fined. They dump their old furniture on the streets and then stick a sign to it: ‘A donner’ – for free. Escalators of the metro are out of order all the time. Some roads are being under construction for years, leading to more chaos and irritation. At the beginning of this year, I didn’t have a pavement in front of my house for a month (the workers just disappeared). One of the most bizarre things here are the signs for road works, which express the way people improvise continuously. There is an artist who follows these Belgian Solutions closely and even publishes books full of examples of them, without being judgemental. 3. Je-m’en-foutisme. People care more about their close relationships with family and friends, than about the public spaces (see also the next point). So drinking beer in the bus? The bus driver: Je m’en fou! (I don’t care) Want to buy something in the supermarket ten minutes before closing time? The shop manager: Je m’en fou! Get out! Want to pay by card? The restaurant owner: je m’en fou! There is a cash machine a few streets away. 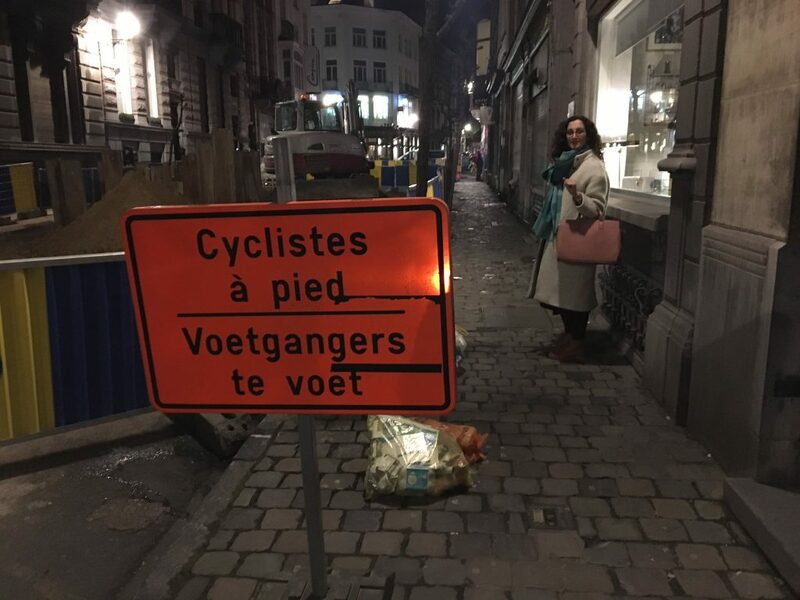 Of course, most Belgians do have a spirit of service, of doing something nice for strangers, but all too often I see another side of the inhabitants: you just have to f*ck off or look away. 4. Lack of a maintenance culture. I know, the Dutch like to be perfect. Everything needs to be clean, efficient and organised in my home country. Contrast that with the Belgians, where uniformity is abhorred. ‘We are real anarchists,’ said the Flemish writer Geert van Istendael once. Crumbling facades, graffiti on buildings, public infrastructure falling apart – the average Belgian wouldn’t even understand what I am complaining about. I once read an unexpected defence to this lack of a maintenance culture. ‘We use our materials until they are completely worn out. This is what sustainability is about.’ The Belgian continued: ‘In any case, there is also a certain charm in decay, right?’ Sounds like Absurdistan to me. 5. Taxes and rules. The tax burden in Belgium is very high (unless you are a fonctionnaire at the European Union). The country has one of the highest employer tax rates in the world. If you’re self-employed like me, you can easily lose up to two-thirds of your gross income. And for what in retun? OK, healthcare is cheap and affordable, but for the rest, Belgium offers a fraction of the service you can get in countries like Sweden and the Netherlands. That is because of the outsized and grossly inefficient public sector in Belgium (there are SIX governments and parliaments in this country of 11 million souls) but also due to widespread corruption, a burgeoning black economy and the aforementioned je-m’en-foutisme. Add to this the enormous bureaucracy of rules and regulations that you have to adhere to when running a business or renovating a house, and you know why Belgium has a certain reputation. One striking example: The European Commission has called the super strict rules for Airbnb in Brussels ‘out of proportion’ and started an investigation. So dear reader, Brussels really is a mixed bag. 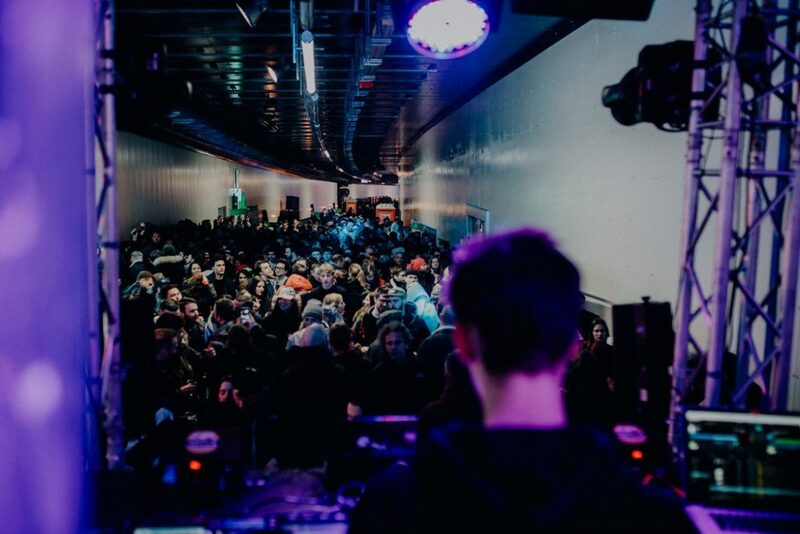 There are moments when you will love living in this city, especially during the first few years as you dance in an old factory or in a metro tunnel to the hippest house music you can imagine. But you will also loathe this place when there is another national strike, being organised every year just for the sake of it, and public transport and supermarkets close their activities to celebrate socialism. There will be times when you are ready to pack your bags and head home. But also moments that you will relish, as you marvel at the fin de siècle architecture in Ixelles, St Gilles and Uccle or enjoy a cocktail on a sun-lit square where nearby food stalls sell cheap and delicious organic food, and everyone around you is relaxed and happy. In 2017, I seriously considered leaving Brussels. I had enough of it and I started to call this place Hellgium. Not work wise but city wise, also because most of my new friends had left. But then one long-time Brussels immigrant told me that he had the same experience. ‘You think about it, you fight against Brussels, and then you just give up and accept living here.’ I am about to do the same. According to latest @EurobarometerEU, support for #EU membership remains at historically high level. 61% say it is a “good thing”. Numbers in favour of EU superior in every MS (though #Italy only country where citizens not convinced of benefits).